Learn how to define conditions for measuring and reporting performance of a specific contract. The Service Level Policy defines conditions for measuring and reporting performance of a specific contract. Each policy is composed of a Rule and an Access Interval. Rules represent the conditions you define to measure and report performance of a service contract. When a defined system condition matches a defined rule, an alert is raised. A Rule is composed of Rule Elements (Alert Code, Metric, Operator, Value, Units, and Interval) that you can configure to meet your service monitoring requirements. An Access Interval is composed of one or more Access Days (Sunday through Saturday). Each Access Day is configured with an Access Time that can represent one complete day (All Day) or a date range (Range) that is specified using a 24-hour clock format (HH:MM). For more information, see About QoS Policies. When you add a Service Level Policy Rule, you define the service measurement and reporting configuration that will be referenced by services and contracts. The attributes you will define are listed below. The name and description you assign to the Service Level Policy. Rules represent the conditions you define to measure and report performance for the specific service that is referencing or contains the configuration of a Service Level Policy. When a defined system condition matches a defined rule, an alert is raised in Policy Manager. Note: You can select from available SLA Custom Alert Codes in the drop-down list box on the Alert Code field. You can also enter a new SLA Custom Alert Code directly into the Service Level Policy Rule line item. The minimum SLA Alert Code start number is 700000. For more information on adding a new alert code in the Alerts > Alert Codes section of the Management Console, refer to About Alert Codes in the Policy Manager Online Help (accessible via the Policy Manager Management Console). A rule is composed of the elements shown below. The Alert Code identification number that represents the alert that is sent when the defined condition is met. This value is manually entered into a text box. A Metric is a measurable function (such as a Response Time) that is used in the rule calculation. Available values are shown below. An Operator is a symbol that represents a mathematical function (<=, >=, etc.) used to limit or expand your search to qualify the metric. Available values are shown below. A Value is a numerical value that establishes the threshold of the metric. This value is manually entered into a text box. A Unit is the unit measure by which the value is counted. Available values are shown below. An Interval is the time interval over which the rule is measured. Available values are shown below. [>]  [Seconds] in a [1 hour] time interval. The first threshold indicates that there might be a problem with a service monitored by the Service Level Policy. The second indicates that there is a problem, but it might not be a serious one. The third is a warning that there is a major problem that needs to be addressed immediately. Send alert code  when the [Maximum Response Time] for Service Operation is [>]  [Seconds] in a [15 minute] time interval. Response time is slow, but tolerable. Monitor this service. Send alert code  when the [Maximum Response Time] for Service Operation is [>]  [Seconds] in a [1 hour] time interval. Response time is unacceptable. Investigate. Send alert code  when the [Maximum Response Time] for Service Operation is [>]  [Minutes] in a [ANY] time interval. Response time is critical. Address immediately. Access Time is configured by defining an Access Interval. An Access Interval is composed of one or more Access Days (Sunday through Saturday). Each Access Day is configured with an Access Time that can represent one complete day (All Day) or a date range (Range) that is specified using a 24-hour clock format (HH:MM). Checkbox options that allow you to select the days you would like to include in the Access Interval. Selectable days: Monday, Tuesday, Wednesday, Thursday, Friday, Saturday, and Sunday. Access Time A drop-down list box option that allows you to select All Day or Range for each Access Day defined in the Access Interval. All Day represents a full 24-hour day. Range allows you to select To and From times using a 24-hour clock format (HH:MM). From Time (Hours:Minutes) Hour and Minute drop-down list boxes that allow you to select the From Time range to apply to the Access Time selection for the Access Interval definition. Hour increments are based on a 24-Hour. Hour and Minute drop-down list boxes that allow you to select the To Time range to apply to the Access Time selection for the Access Interval definition. Hour increments are based on a 24-hour period. A drop-down list box that allows you to select the time zone to apply to the Access Time for the current Access Interval definition. Let's take a quick walkthrough of the Service Level Policy configuration process to get you started. In Policy Manager, to create a Service Level Policy instance, go to Policies > Operational Policies and choose Add Policy. Configure the policy options based on your requirements and click Apply. For a functional overview of each rule element, refer to the Service Level Policy Options section. After you've attached the Service Level Policy to a web service, operation, or binding, send a request to your service and go to the Services > Monitoring section to view the results for Logs, Real Time Charts, and Historical Charts. For more information on using the monitoring functions, refer to the Policy Manager Online Help, available via the Help button. This section provides a list of Policy Manager-specific usage scenarios for the Service Level Policy. SLA generates an alert and sends an email to alert the administrator when more than 50 requests have been sent to an API in 1 minute. Configure the Service Level Policy as per the use case with the above alert code and greater than 50 usage count in 1 minute. If there are more than 50 hits for a service in 1 minute, the SLA alert is triggered at the beginning of next UNIX time minute and an email is sent to the administrator. In this scenario, set up an SLA that generates a clear alert and sends an email to alert the administrator when the throughput has dropped below 50 requests in a minute. Add an alert code to the Policy Manager Management Console in the Alerts > Alert Codes tab with email configuration. If there are more than 50 hits for a service in 1 minute, the SLA alert is triggered at the beginning of next UNIX time minute. For the next 1 minute, if there are no SLA violations, a clear alert is generated at the beginning of the next UNIX time minute. In the alert, email has to be configured so as to send an email to the administrator as below. In the example below, the SLA policy generates an alert and sends an email to the alert the administrator when more than 300 requests by a configured App have been sent to the API in a 15-minute interval. Configure the Service Level Policy as per the use case with the above alert code, and greater than 300 usage count in 15 minute. 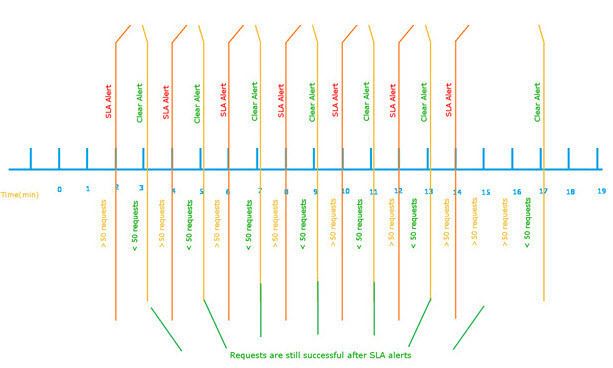 If there are more than 300 hits for a service in 15 minutes, the SLA alert is triggered. Scenario 1: How Do I Verify Service Level Policy Alerts at the Service Level? Scenario 2: How Do I Verify Service Level Policy Alerts at the Contract Level? Scenario 3: How Do I Verify Service Level Policy Alerts at the License>Term Level? If you are using a Service Level Policy with Community Manager, you must first add the policy to the Community Manager Tenant Organization in Policy Manager. Once that's done, it will be available for selection in the developer portal. Specify Policy Name, Policy Type (Service Level Policy), click Finish, and then click Close. 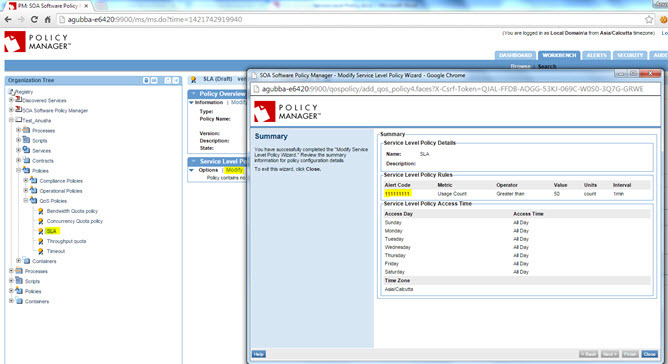 On the Service Level Policy Details screen, click Modify. Review the metrics that are available for Service Level Policy configuration, and configure the metrics based on your requirements. For example, we will use the Usage Count metric in the use case below. Click Next to continue. Configure Access Day and Access Time, click Finish, and then click Close. In the Quality of Service Policies section, attach Service Level Policy. In the Operational Policies section, attach Atmosphere Application Security Policy (No Signature) and Detailed Auditing. Go to the app that is connected with the above API (App > Test Client) and send more than 5 requests. Result: When a policy condition matches a defined rule, an alert is raised in Policy Manager > Registry Level, as shown below. Note: These alerts are not supported in the Community Manager Dashboard. In Policy Manager, select View Alert and review the alerts. While requesting API Access, select the Service Level Policy checkbox and finish the process. Make sure the contract is activated. Note: This scenario assumes that the Atmosphere Application Security Policy is attached to the API implementation (API > Implementation > Policies). When a policy condition matches a defined rule, an alert is raised in the Policy Manager > Registry level. After a 1 min interval, the SLA will be cleared. Scenario 3: How Do I Verify Service Level Policy Alerts at the License > Term Level? While adding an API, select the Use Licenses check box. Go to Administration > Scopes and click Add Scope. Provide details based on your requirement and save. Go to Licenses and click Add License. Provide details based on your requirements and click Next. Select Scope and click Next. 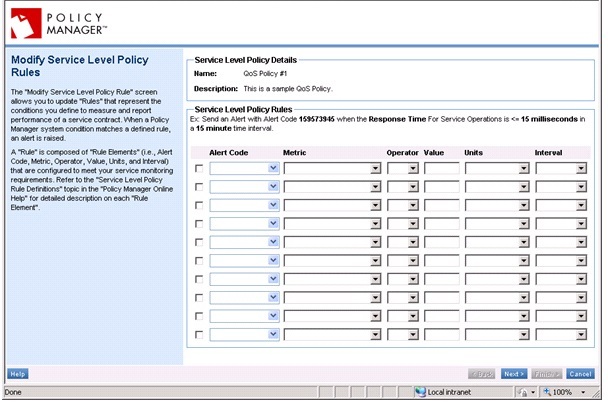 Attach QoS Policies > Service Level Policy at the Terms level, and click Next. Upload Legals (if required) and click Finish. The license is now configured with the QoS Policy attachment at the Terms Level. Next we have to use this scope in API > Scope Mapping. Go to the API and click Scope Mapping. Map your scope at Operation level or at API level. Select Scope, then confirm and save changes. Now request API Access for this API. While requesting API access, select the licence that is attached to the QoS Policy at the Terms level. Next, Go to Test Client and send more that 5 requests to meet the defined Service Level Policy rule.